File and MP3 Renaming Utility. 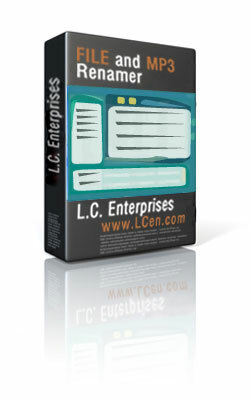 The Complete File Renaming Solution! FILE and MP3 Renamer 2004 registered user: Please contact us in order to get your new Registration information. Registered users of older versions are entitled to a free upgrade to the 2003-Version, or a paid upgrade to the most current version. Please visit our FAQs page for more information. Buy Now through PayPal and choose the price yourself! Buy now securely with a Credit Card through PayPal.com! Buy now securely with a Credit Card (American Express, Diners Club, Discover, JCB, MasterCard, Visa) through 2CheckOut.com! Buy now securely with an Online Check, Direct Debit, JCB, Discover or an EasyBuy Card through 2000Charge.com! File and MP3 Renamer 2006 lets you rename multiple types of files or even folders with ease. It's excellent for renaming several files or for creating a file series, and it is fully configurable. You can also Preview and/or Undo the renaming results in seconds. Supports ID3v1/ID3v2 Tags from MP3 files. FILE and MP3 Renamer 2006 is one of the oldest programs of its kind (it has been around and evolving constantly since 1998) and is probably the first program ever to be called a "Renamer". It is also one of the fastest, most reliable, stable, flexible and versatile programs of its kind. You can see some basic and advanced Renaming Examples in order to get an idea of the power of its scripting capabilities. Support for skins, sounds and multiple languages (more languages coming soon). Scriptable renaming options: custom renaming functions can be added by experienced users or by our staff. Renames using keywords (format codes): combined properly, these keywords and functions can help solve just about any renaming task. For more information about what they do and the supported syntax click here. Here's a list of the currently supported codes. Replace Characters: lets you quickly replace a set of characters from an existing file series with another set of characters, E.g. : serie01.jpg to Anna01.jpg, you replace "serie" with "Anna", the rest remains unchanged. Remove Unwanted Characters: lets you remove any set of characters from a filename, E.g. : robert~1.jpg to robert1.jpg. Trimming functions: left and right trimming by string, fixed and maximum number of characters. Can rename Files and Folders. Can create folders according to certain parts of a file name or ID3Tag fields such as "Artist", then move the files/folders to their respective folders. Preview: lets you see how each file will be renamed before taking any action with your actual files. Favorites Menu: so that you can quickly go to the folders that you specify. Context Menu: you can right-click on any folder and "Open with FILE and MP3 Renamer 2006". Now Faster, Better, Easier to Use and with better error handling. Undo button lets you undo any renaming process or tag changes with one click. Extracts the Tag Information from the filename. Rename your MP3s using the information contained in the ID3 Tag. ID3v2 support lets you copy or upgrade your ID3v1 Tags to the new ID3v2 Tag of the MP3 file with one click. Mass setting of ID3 Tags. Drag & Drop support to open Folders. Remove your old and obsolete ID3v1 Tags with one click. Support for digital camera meta tags in EXIF format. Found a Bug? Tell us about it and we will do our best to repair it within 24 Hs. Want a new feature? Tell us about it, we might add it. ZDNet 5 Stars Award See Review! WINUSER Forum on CompuServe Pick of the Week AUG 23-29, 1998. This shareware application can be found in the WINUSER Forum on CompuServe, an official distribution and support online resource for future updates. Search for File and MP3 Renamer 2006. The Windows Users Group Network WUGNET, operators of the oldest and largest independent support resource forum for Windows users on CIS with over 1,000,000 active members is recognized in the press, user groups, developers, and Microsoft as the foremost resource for shareware publishers on CompuServe and the Internet.